Check out all these awesome ideas for what to put in your South Hill Designs Floating Lockets! So Cute! 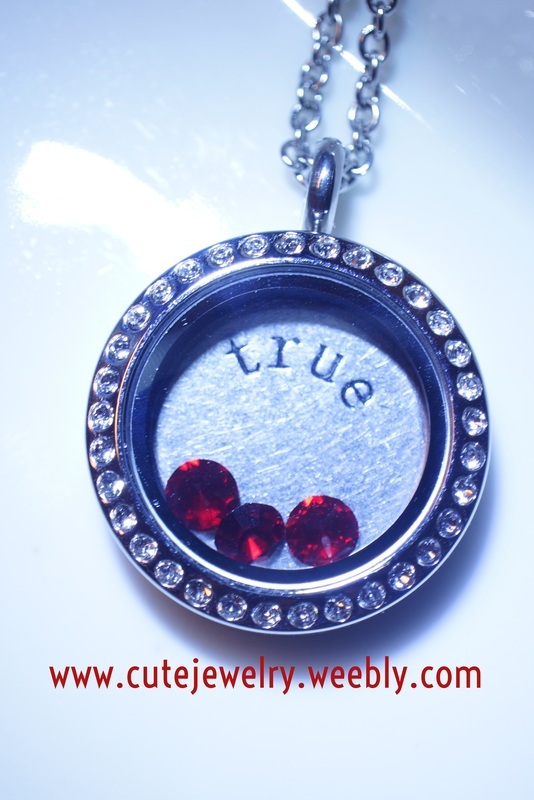 This locket is perfect for a teenager, or the trendy hipster! South Hill Designs Mustache Charm is so cute in this Pink Swarovski Mini Locket! South Hill Designs offers many Vintage Charms for your glass floating locket. I love this look of the Rose Gold South Hill Flower Screen, Pearls, and the Blue Cameo Charm, all in a Large Rose Gold Locket. So pretty! Also in South Hill Designs Vintage Charm collection, this Medium Silver glass floating locket looks great with the Sparrow Bird Charm, Hummingbird Charm, and Vintage Rose Charm. Who doesn't adore their dog? This Large Silver glass floating locket features South Hill Designs Dog Charm, Red Heart with Paw Charm, Crystal Bone Charm, and "Love" Charm, along with red and black crystals. Perfect for showing off your four-legged kid! South Hill Designs Floating Glass Lockets are a great way to show your faith. 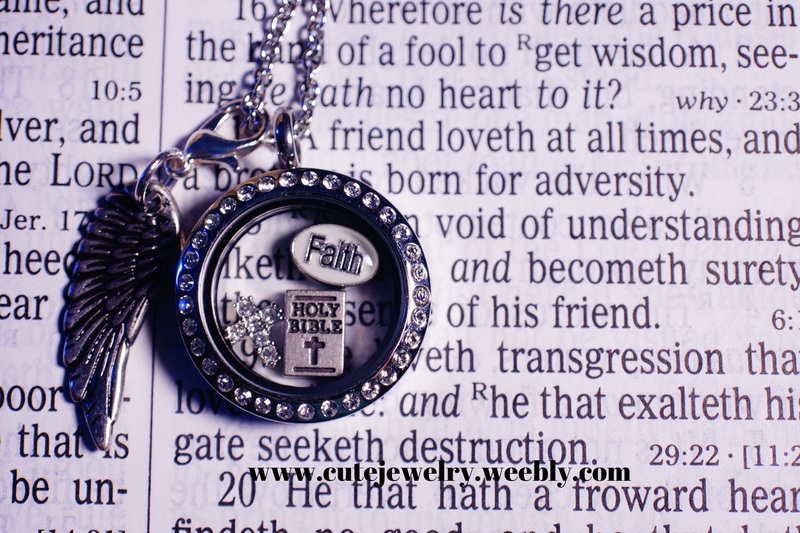 This Medium Silver Crystal locket features the Holy Bible Charm, Crystal Cross, and "Faith" Bubble Charm. Attached to the chain is our Wing Droplet. Check out www.southhilldesigns.com/cutejewelry to see all of our Faith Charms. Are you a chef? Do you bake? Do you just like to eat? South Hill Designs has you covered with our huge variety of Food Charms. This Large Gold Locket with Crystals has the Chef "I Love to Cook" Charm, Travel Coffee Mug Charm, Wine Bottle Charm, Waffle Ice Cream Cone Charm, Cupcake Charm, and my favorite, the Garlic Clove Charm! Yum! Are you a girly-girl? Do you love to shop? Love your handbags and high heels? We do too! 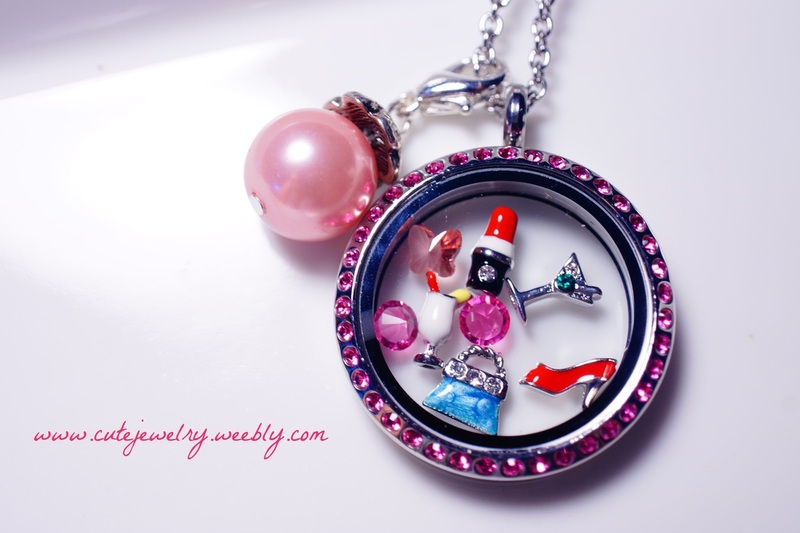 This Large Silver glass floating locket with Pink Crystals has our Blue Purse Charm, Red High Heel Charm, Red Lipstick Charm, Tropical Drink Charm, Martini Charm, Peach Butterfly Crystal, and Pink Crystals. Attached to the chain is our Pink Pearl Droplet. Perfect for Girl's Night Out! I love a good movie! This locket is perfect for movie fans. The Large Gold Crystal Locket features the Gold Gear Screen, Movies Charm, Camcorder Charm, Popcorn Charm, and Soda Charm. So cute! Whether you just love to listen to music, or create music, South Hill Designs has all the ways to show your love of music. This Medium Silver Crystal Locket has the Treble Clef Charm, Sunglasses Charm, Headphones Charm, and Guitar Charm. Head over to www.southhilldesigns.com/cutejewelry to see our other music charms. "Somewhere, beyond the sea....!" This Medium Silver Crystal Locket has a blue crystal, Lighthouse Charm, Cruise Ship Charm, and Crystal Anchor Charm. Attached to the chain is our Anchor with Rope Droplet. Perfect for Summer! Do you have a baby on the way? Is there a new mom in your life? This Large Pink Crystal Silver Locket has our Blue Baby Carriage Charm, a pink crystal, "Mom" Heart Charm, "Family" Heart Charm, Footprint Charm (found under our "Faith" category, but doesn't it make you think of a baby footprint? ), and Girl Birthstone Charm with pink crystal. Attached to the chain is a Champagne Pearl Droplet. Who doesn't need a reminder of happiness and peace in their lives? This Large Crystal Gold locket has the Smiley Face Charm, Crystal Peace Charm, Pink "Hope" Charm, and Yin and Yang Charm. What a great way to start your day on a positive note! Are you a teacher? Do you want to give your teacher a great gift? 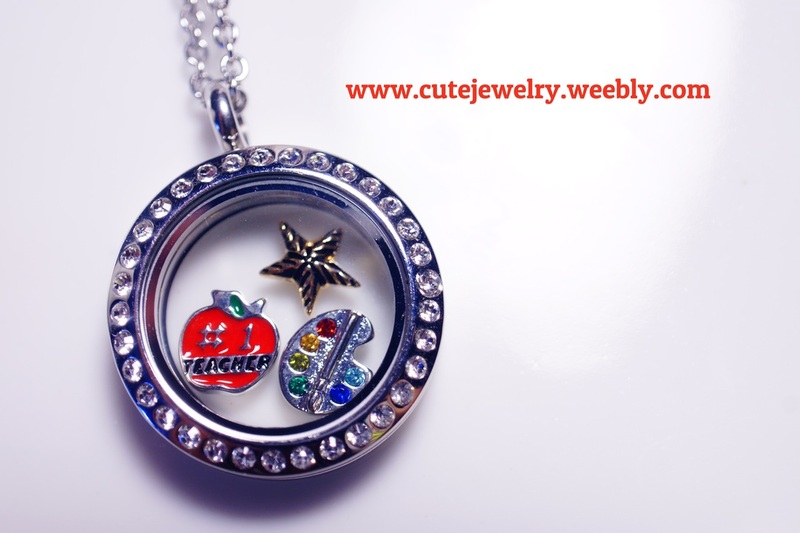 This Medium Silver Crystal locket has an Apple "# 1 Teacher" charm, Paint Palette Charm, and Gold Star Charm. Honor the great teachers! London, Paris, Dublin, Amsterdam, New York, all the great cities of the world! Whether you have already gone to these places, or are still hoping to go, these travel charms define Cute Jewelry! A Large Rose Gold Crystal Locket features an Airplane Charm, "I Love NY" Charm, Claddagh Ring Charm, Eiffel Tower Charm, Cruise Ship Charm, and Telephone Booth Charm. What a great keepsake!